I had the pleasure of chatting with today’s guest, Nancy Zieman back at Spring Market and am excited to welcome her back to the blog for National Sewing Month. The Stack ‘n Store Bobbin Tower has six bobbin wheels on a stand. See thread colors at a glance. Each wheel holds five bobbins. 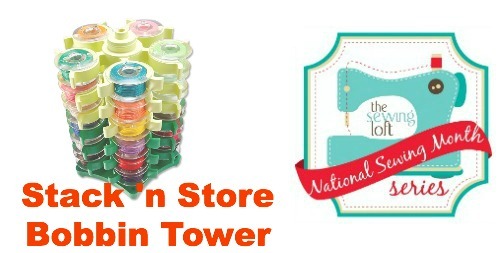 The Stack ‘n Store Bobbin Tower organizes up to 30 bobbins. Wrap loose thread ends around bobbin. Slide bobbin into wheel section. Stack wheels on bobbin tower stand. Bobbin thread generally takes a back stage role. Since this blog features bobbin thread, I’d like to show you how to bring the bobbin thread to the forefront I call the technique, Undercover Stitching! I wound a few bobbins with 12 wt. decorative thread and stored the extra ones in my Stack ‘n Store Bobbin Tower. Then, added undercover decorative stitching to the fabric of my Tablet Keeper, a cover for my iPad. During the first program of the 2-part Sewing With Nancy series, Sew Techie Covers, I detail the undercover stitching technique. You can watch this program and 51 other program online! Or, watch on Public TV. These easy stitching techniques are all great ways of personalizing a cover for your iPad, original Kindle, or a larger Tablet. Intrigued? Just click and watch! To create these great ideas, I used Clover’s E-Tablet & Paper Tablet Keeper Templates—a product that I designed! I know that not all of you click to watch the video, sigh… To give you a little idea of what you may be missing, here are the highlights of one of the three easy stitching techniques, Undercover Stitching (otherwise known as bobbin work). Wind 6- or 12-weight thread in the bobbin, using conventional bobbin winding techniques. I selected Madeira’s Decora 6 wt. thread. Note: If your machine has difficulties winding heavier thread, wind the thread by hand. Thread the needle with all-purpose thread. Insert the bobbin into the bobbin case. Back the fabric with interfacing, and add a second stabilizer and length of interfacing in the stitching area. Then, arc the stitching line on the wrong side of the fabric. Choose a nonsatin, decorative stitch. An outline or open stitch is best suited for bobbin work. Lengthen the stitch for best results. Test the stitch on a sample fabric. Check the look of the stitch on the right side. My test stitch had a few hiccups! So, I adjusted the settings, lengthening the stitch. It doesn’t always go perfectly for me either! Helpful Hint! Some machines handle heavier thread in the bobbin if you bypass the bobbin case tension. In short, don’t pass the thread through the bobbin case tension guide. Also, test a variety of stitch settings, lengthening/shortening or narrowing/widening the stitch length and/or width. A straight stitch is also ideal! A narrower stitch width setting was used for the strap. The Undercover Stitching idea is just one of 12 techniques found in Sew Techie Covers! Check out all the options! Watch Sewing With Nancy on your iPad, iPod, or iPhone! There are 52 Sewing With Nancy programs to watch online, or on your iPad, iPod Touch, or iPhone. Have you downloaded the app? Thank you Heather for asking me to share one of my favorite sewing notions and for celebrating national sewing month! A big Thank You to Nancy for stopping by to visit again this year, she has been super busy this month! Stay tuned, Sara from Craft Snob is wrapping up the month with her post tomorrow. Oh and don’t forget, it’s giveaway time! 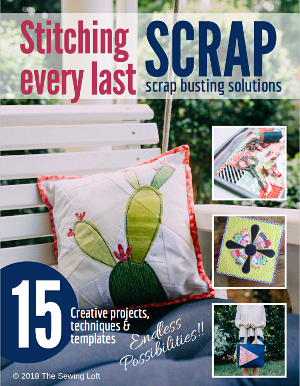 There is still time to enter National Sewing Month 2013 giveaway for some of those amazing prizes! Check out the prize packages and enter to win here. Very cool bobbin tower! My bobbin thread is always everywhere, this would hold it in place nicely! I have one of these and I love it with one exception, I wish they would lock together a bit better because they’re always falling apart. And I think I need another one, I’ve tried to keep regular thread on one color & embroidery bobbin thread on the other but I’m running out of space on the regular thread. A really neat gadget. Thanks for sharing with us Nancy! Thanks for sharing I really love that tower. the tower would certainly keep my sewing area a lot more tidy. I just love the tower ,that would help in a small space. How cool, would help keep things a little more tidy!! Thanks! What…no more bobbins and thread rolling amuck?! Wow!!! I find bobbins half full everywhere! Thanks Heather for all you do! I have bobbins in too many places. This would solve my problem.Thank you! There are always such great ideas here! Thank you for providing a terrific idea for scattered bobbins. 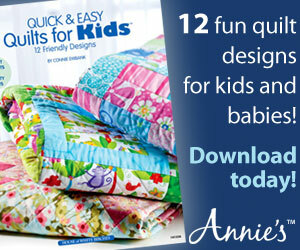 Winning a Baby Lock sewing machine would make a long time dream come true! I could tell all of my friends and invite them over to try it! The bobbin tower is really neat. great ideas for gifts thanks. interesting notion–thank you for sharing your personal likes w/ us! I like the notions, and the give away. Wonderful ideas! Looking forward to the giveaway!! !